With the Navy’s increasing pivot to the Pacific region, San Diego’s shipbuilding and repair industries are poised for growth, adding 2,000 jobs in 2015 alone. That was among the findings of a report released Monday by the San Diego Military Advisory Council at a press conference outside the General Dynamics NASSCO shipyard in Barrio Logan. The report, prepared by economists at Point Loma Nazarene University’s Fermanian Business & Economic Institute, found that the shipbuilding and repair industry employed over 14,000 people in 2015 and paid manufacturing wages averaging $67,000. Another 3,000 jobs were dependent on those shipyard employees, bringing the total payroll from the sector to $1.25 billion. Mayor Kevin Faulconer speaks at the press conference. The report noted that the industry “demonstrates the ability of manufacturing to be competitive in California and San Diego” at the time when a state-of-the-art Navy requires highly skilled workers. By 2020 some 60 percent of the fleet will be based in the Pacific and provide “sizable work for San Diego’s shipyards in terms of modernization, repair and maintenance” for the Navy, the report predicted. “San Diego’s shipbuilding and repair industry, combined with a complex network of firms in the supply chain, represents a valuable ecosystem for the region’s economy and an asset critical to the nation’s global defense,” the report concluded. 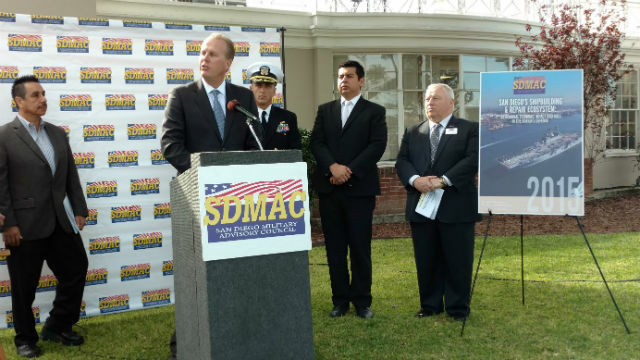 The report’s release drew a number of political, military and business leaders, including Mayor Kevin Faulconer and Councilman David Alvarez, who represents Barrio Logan. 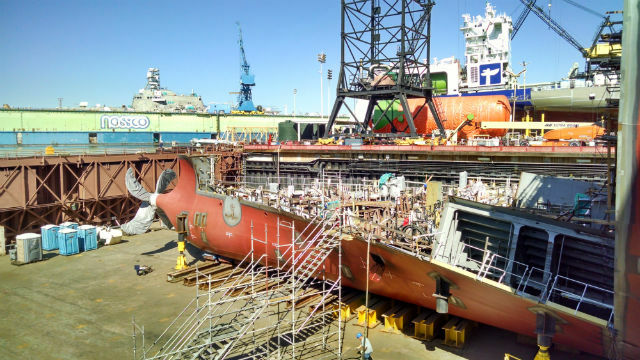 “This is where the good jobs are,” Alvarez said, noting that NASSCO and other shipbuilding companies provide jobs for skilled high school graduates who might not find positions in other areas of San Diego’s economy.